Product prices and availability are accurate as of 2019-04-22 04:29:03 UTC and are subject to change. Any price and availability information displayed on http://www.amazon.com/ at the time of purchase will apply to the purchase of this product. Voodoo Tactical' s fully adjustable chest rig/plate carrier has an easy access hook-n-loop pocket that will hold 10"x12" plate when worn over body armor. 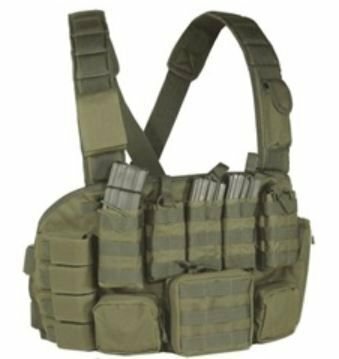 It has seven M4/M16 30 round mag pouches doubles on each end, four covered pistol mag pouches, an attached zippered pouch for IFAK with rear document pocket, multiple zippered ammo/accessory pouches and a padded, adjustable shoulder harness with PALS webbing and attached electronics pouches. PALS webbing in front to add your mission essential pouches.